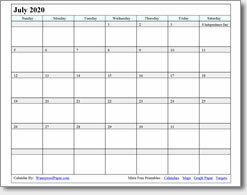 July 2019 Printable Calendar - Print as many as you want. We offer printable July calendars for your free use! Our online calendars are easy-to-print .pdf files that you can download and print from almost any computer with Adobe Reader and an attached printer. They fit the standard 8 ½" x 11" sheet of paper. July always has 31 days and is the month when people in the United States celebrate Independence Day on July 4th. It is a day when people are off work, have cookouts and watch neighborhood fireworks! © 2003-2019 WaterproofPaper.com. All Rights Reserved. Images, text and code on this website are property of WaterproofPaper.com. Use without permission is prohibited.